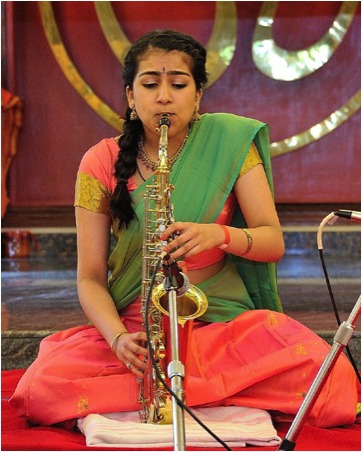 Anvita Hariharan, from Chicago IL, started learning the art of saxophone at the age of eleven and is now undergoing advanced training from Dr. Kadri Gopalanath and Dr. Sumanth Swaminathan. She has performed in several areas around the country including performances at Aradhanas, Marghazi Masam concerts, and Ekanthasevai. She has won various awards at the Cleveland Aradhana and Chicago Tygaraja Utsavam festivals and has performed at many marriage concerts around the Midwest area as well. She is also currently pursuing vocal carnatic music under the guidance of Shri Palai CK Ramachandran. Anvita is a junior at Waubonsie Valley High School and plays the clarinet in the Wind Ensemble and the baritone saxophone in the Jazz Band. She has been a recipient of multiple scholarships for her dedication to music for both Carnatic as well as Western. Aside from music, Anvita enjoys studying science and looks to pursue a major in the medical field.